In a part of the house session where members can speak on wide-ranging topics, Sims had just begun his remarks when he was shut down. It takes just one legislator to end the impromptu remarks. Rep. Daryl Metcalfe was one of the House Republicans who objected. “I did not believe that as a member of that body that I should allow someone to make comments such as he was preparing to make that ultimately were just open rebellion against what the word of God has said, what God has said, and just open rebellion against God’s law,” said Metcalfe, R-Butler. Two more Democratic legislators got up to speak in support of Sims. Neither was allowed to proceed. “This is a guy who hates women, he hates gay people, he hates minorities and he hates immigrants,” Sims said. Metcalfe is among the most conservative state lawmakers. He has sponsored pro-gun-rights rallies and organized opposition to people who enter the country without legal permission. 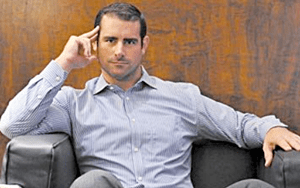 I don;t know about you but I, for one, would be more than happy to be in open rebellion of God’s Law with the WOOFY Brian Sims any day. Gayly News Briefs: Occupy London Takes Over Cruising Area, Baptists Use NOM race Baiting Moves, Kellogg’s Caves To Hate Group, and MORE! In my opinion anyone, from high to low, from simple citizen to the highest in office, should be thrown back when and if a law not custom in the land is invoked, and especially when a lawmaker is is invoking a religion! When Christians are allowed to invoke God’s law, and thus force people to live according to that law, then Muslims are entitled to the same rights, and are, in my opinion at least, rightfully entitled to invoke the sharia law! I feel that lawmakers should act according to the Constitution, and as we all know (or should know), the US Constitution prevents invoking religion in anything that has to do with politics……. Or, in another interpretation, IF Christian God’s law is invoked, then the Divine Heads of other religions equally must be (allowed) to be invoked! And I have the idea, but correct me if I am wrong there, that Daryl Mettcalfe is not willing to allow muslims to invoke their religious law, ie the sharia.